New in-floor electric radiant heat system, made in America, gives homeowners an easy and cost efficient way to add gentle supplemental electric radiant heat room by room to homes in any climate. NORFOLK, Neb. – Nov. 5, 2015 – The new QuietWarmth Radiant Heat Film for Floating Floors, from MP Global Products, is an excellent supplement to a primary heating system that can be installed in any room in a home where extra warmth and coziness is desirable. It is a great choice for bedrooms, bathrooms, playrooms, three-season rooms that typically do not have heat, rooms where babies, toddlers, and pets play or lay on the floor, and rooms that are inherently chilly. 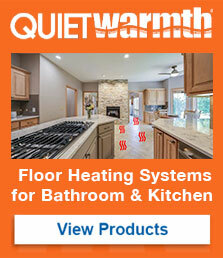 Installed over a subfloor and under a finished floor, QuietWarmth Radiant Heat Film uses just three main components: the ultra-thin flexible radiant heat film; an in-floor sensor that monitors the temperature of the floor, not the room, and aims, typically, for a setting just a few degrees above room temperature; and a GFCI thermostat that gives occupants local control of the room’s coziness.Most of the installation can be performed by the homeowner or a flooring contractor, with only the final hookup of lead wires at a central electrical box requiring the services of a licensed electrician. The system, which is draft-free, fan-free, and silent, uses just 12 watts per square foot, conforming to the warranty requirements of many floating floors. A programmable thermostat for each installation can be set individually to help prepare the room for anticipated occupancy at various times, for example before breakfast, after school, or in the evenings.